Penelope Disickis ready for her close-up. 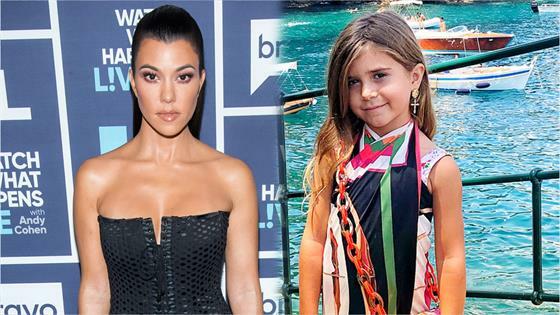 Kourtney Kardashian shared the cutest photo of 6-year-old Penelope with her new haircut on Monday and fans are loving the six-year-old's bold new look. She said goodbye to her long brown locks and said hello to a chic bob cut. But it may come as a surprise to some that this is the first time the little one has gotten a haircut in her "enchanting" six-years of life. Penelope clearly loved the new 'do since she flashed a peace sign with her hand on her hip for the sassy photos. And it seems like her entourage loves it too! Kourt's friend Larsa Pippen commented, "My baby is too trendy." The milestone moment also came as a reminder to family and friends of how fast Penelope is growing up. "Omg she's a full grown up," Stephanie Shepherd said. To see how much Penelope has grown up over the years, check out the gallery below! After six "enchanting" years on this earth, Kourtney took her daughter to get her first ever haircut. "Date Day" Scott posted while enjoying a weekend outing with his only daughter. Penelope basks in the sun with mom Khloe Kardashian in Miami. Penelope and cousin North West dance and sing together. Penelope and Aunt Khloe Kardashian share a special moment. Penelope wears one of her favorite costumes, as seen in a photo mom Kourtney Kardashian posted on the child's fourth birthday. P and Nori rock mermaid tails during an under-the-sea themed party. It's never too early to perfect your selfie game! The besties make perfect Disney princesses, don't you think? The trio looks like characters from a fantastic fairytale. North and P are all smiles as they hold hands. Too cute! Penelope is already perfecting her model pose. P celebrates Christmas with auntie Koko. Penelope and North get their hands on a copy of Khloe's new book. The mommy-daughter duo cuddle before bed time. Penelope rocks a neon green tutu for dance class. Could these BFFs be any cuter?! Kourt and P ride a carousel during a visit to Disneyland. Kourtney shared this sweet snapshot of Penelope and Mason cuddling in bed. P kicks back with brother Mason and cousin North West. Kourtney Kardashian shared this photo of her daughter on Instagram on Feb. 11, saying, "Tap shuffle step." "Birthday princess," doting aunt Khloé Kardashian tweeted. "Happy Birthday my little pushka! I love u so much!!!!" Kim Kardashian wrote as the caption to this adorable pic. "happy birthday Poosh!!!" aunt Kendall Jenner captioned this pic of the doe-eyed cutie. The 2-year-old tot dotes on her cousin—Kim Kardashian's daughter North West—and instantly kills us with cuteness. The soon-to-be big sister clutches her pregnant mama's belly as the two bask in the sunshine. Penelope carefully examines her place setting while waiting for cousin Nori and brother Mason Disick to join her at the table, which was decorated by grandma Kris Jenner. What are you looking at, P?! It gets harder and harder to keep up with the Kardashians, but with kids this cute it's worth it!